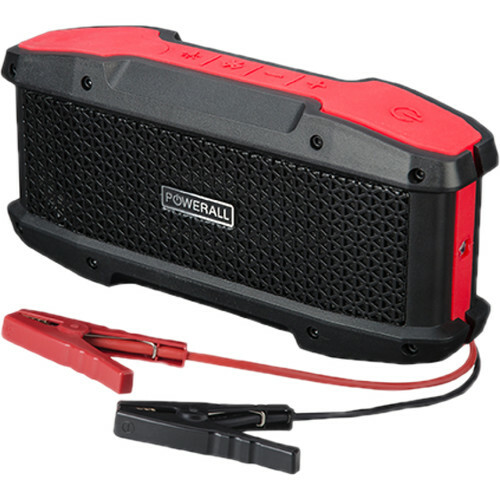 With 600 amps maximum continuous discharge current to jump start your car, the Powerall Journey 16,000 mAh Jump Starter with Bluetooth Speaker from Powerall can get you going again. In addition to jump starting a car, the multi-function Powerall Journey can entertain you with its built-in Bluetooth speaker. Supporting the Bluetooth 4.0 +EDR standard, this speaker can connect to most tablets and smartphones, and the 16,000 mAh battery can power the speaker at maximum volume for up to 12 hours. The Powerall Journey can even be used as a USB power bank thanks to dual 5V/2.1A USB ports capable of charging nearly any USB enabled device. Box Dimensions (LxWxH) 10.8 x 10.5 x 3.2"
Powerall Journey 16,000 mAh Jump Starter with Bluetooth Speaker is rated 1.0 out of 5 by 1.